After a long weekend of travel, I finally find myself able to write about Friday’s qualifying matches. Scotland saw their Euro 2012 qualifying chances sunk as a result of poor refereeing in a match Saturday against the Czech Republic. Kenny Miller's opening goal was pegged back a few minutes later by Jaroslav Plasil. Darren Fletcher looked to have the match won in the 83rd minute after putting home a cross from Kenny Miller, but Jan Rezak's dive in the penalty area earned his country a spot kick which Michal Kadlec converted. 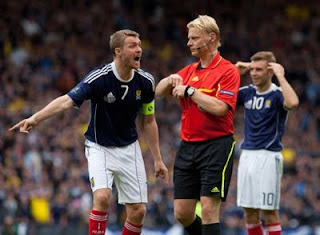 The controversy continued as Scotland's shouts for a penalty went unheeded despite overwhelming evidence to the contrary. Ronaldinho also made a return appearance in the Brazil squad during their 1-0 victory over Ghana. Arsenal has two more injuries to add to the list of Arsene Wenger’s worries as Jack Wilshere will be out at least two to three months with a foot injury. The Gunners will also be without centerback Thomas Vermaelen after heel surgery will sideline the Belgian defender for at least two months. While there is a round of CONCACAF qualifiers taking place, the United States will face off against Belgium in an international friendly. The match will serve as a great opportunity for America to show its worth against a team that is expected to qualify for Euro 2012. Klinsmann will be eager to get his first win as well as manage his first match in which American superstar Clint Dempsey will play. Dempsey missed Friday’s match, undergoing treatment for back spasms. Ireland will take on Russia after a boring 0-0 draw against Slovakia in Group B’s biggest match. Group C has a slate of important games as Italy take on Slovenia, Northern Ireland take on Estonia, and Serbia take on the Faroe Islands. Group D has France taking on Romania and Belarus taking on Bosnia-Herzegovina. Group E will have the Netherlands playing Finland while England will take on lowly Wales in Group G. Denmark and Norway will face off in Group H while Group I will have Scotland see Lithuania and Spain take on Lichtenstein. Brave John Terry gets the background for leading England through the hostile Bulgarian crowd to victory. The demonic gaze is no more.